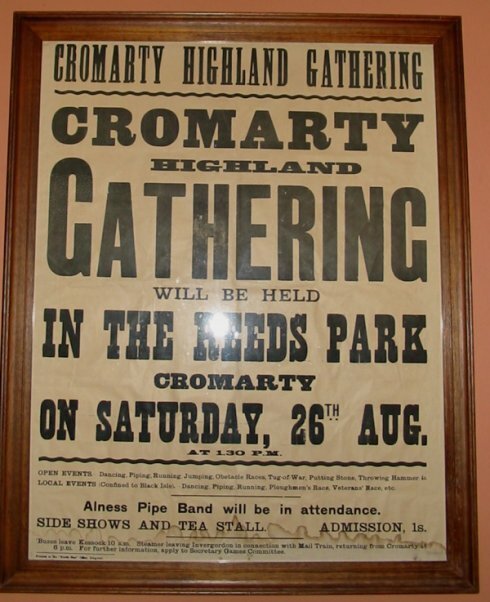 This poster is on display in Weatherglass House, Shore Street, Jane and Pete Clunas's. The years that the 26th August fell on a Saturday were 1905, 1911, 1916, 1922, 1933, 1939, 1944, 1950, 1967, 1972 and 1978. I would suggest 1950. Anybody know? I am looking for Peter Clunas who was our helicopter pilot in 1989 and 1991. Peter please contact me. I think you can rule out 1950. It's more likely to be an event held much earlier say between 1916, and 1933. Maybe some microfiche research of weekly Ross-shire, newspapers, in the Inverness Reference Library might give a definitive answer. Clem - why are you so sure it is not 1950 ? Not that I doubt you, but my suggestion of 1950 was just a guess. by boat? I can't recall any Games being held along the Reeds at that time. Thanks Clem - that makes sense. I'll have a look in Inverness Library over the next wee while. wooden block lettering(hardwood). That same Steamer was sold in 1938 to somebody in the Orkney Islands. Narrowed down that might give you 1933 at a guess? Brilliant Clem - Thanks. A quick look in the North Star archives should solve the mystery, so I'll have a look in Inverness Library.